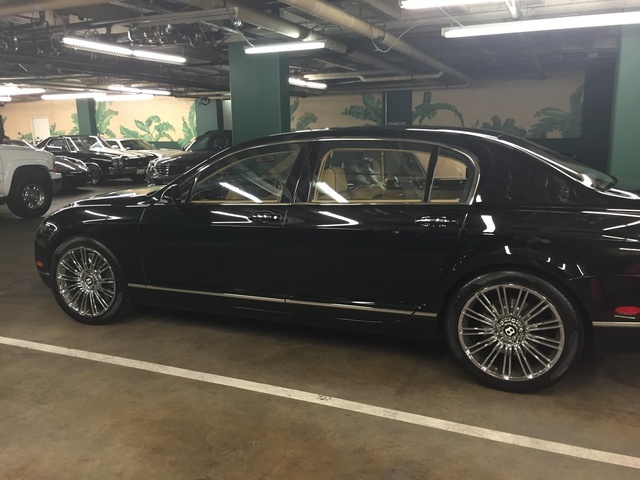 Looking for a Used Continental Flying Spur in your area? CarGurus has 172 nationwide Continental Flying Spur listings starting at $24,990. If Bentley's history is to repeat itself, the largely carried-over 2012 Continental Flying Spur will very likely be the last of this generation. A large myriad of two-tone exterior schemes and 14 different interior tri-tone treatments join the stylistic renderings of this year's Flying Spur and Flying Spur Speed under the banner of the Series 51 design department. When the Continental GT adopted the same exclusive design cues, it was totally revamped for the following year, but so far, Big Ben has been exceptionally tight-lipped about any changes coming down the pipeline. 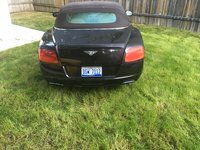 For 2012 Bentley also endowed the entire Continental Flying Spur lineup with new options for blue-painted brake calipers or front fender vents with either black or chrome mesh inserts. Aside from form, Bentley added a touch of long-awaited function by finally answering calls for a modern infotainment system with a 30GB hard-drive-based navigation system in every Flying Spur. The new system is compatible with Google Maps in most places and will find the precise location of photographic geotags stored on an SD card. You would expect such a prestigious company to listen to its customers, and Bentley is no stranger to facing the music—but in its own sweet time. Just like the infotainment system, Bentley owners are critical of the wrinkles showing up in the line's old-world charm over the last few years. However, Bentley does things a little differently than most makers—namely, by hand—and so it takes longer to address some issues. Perhaps the 2013 edition will take care of those concerns—and if Big Ben's history is to be any indication, we can look forward to an inspirational reveal. One thing likely to remain completely unchanged is the Flying Spur's rider focus. All 5,557 pounds of this behemoth are dedicated entirely to impeccably controlled comfort with all-wheel drive and an invincible stability control system working in tandem to keep its four wheels grounded and in complete control. The brakes work far too well for sporty driving, causing a gritty nosedive into tight curves and nearly throwing the tail into a spin or at least a drift in the process, but again the brakes put their boots down against such silly antics and bring the car back to balance within seconds. In so doing Bentley has managed to eliminate the vast majority of G-forces passengers must endure, the end result being at least a full point of lateral gravity less than its next nearest Rolls competitor—but Big Ben didn't stop there. The engine too is geared specifically toward dense comfort, offering all 479 lb-ft of torque from 1,600 rpm clear up to peak 552 horsepower at 6,100 rpm. This makes for a deceptively powerful machine capable of carrying itself up to triple-digit speeds effortlessly, and with no hint at all as to when this 6-liter 12-cylinder shifted on its way up to 6th gear. Although the serene cabin and silken engine would have you believe the world outside has no effect on you, there is one shift you're sure to notice—getting just 11 mpg city/19 highway. No word on whether a hybrid is in the works, but if Big Ben is serious about getting modern it would do well to address the Flying Spur's only vulnerability: thirst. 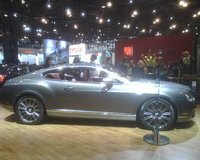 What's your take on the 2012 Bentley Continental Flying Spur? 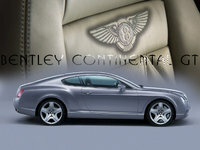 Have you driven a 2012 Bentley Continental Flying Spur?